It was cold, it was dark, and I was disappointed. My parents and I had arrived on the evening bus from Toronto, but this was not the Niagara Falls I had expected: this place was brash, bright, and commercialized to the extreme, full of fast food chains, casinos, and garish souvenir stores. Of course, I shouldn’t have been so quick to judge, and should have remembered that old maxim of not judging a book by its cover. 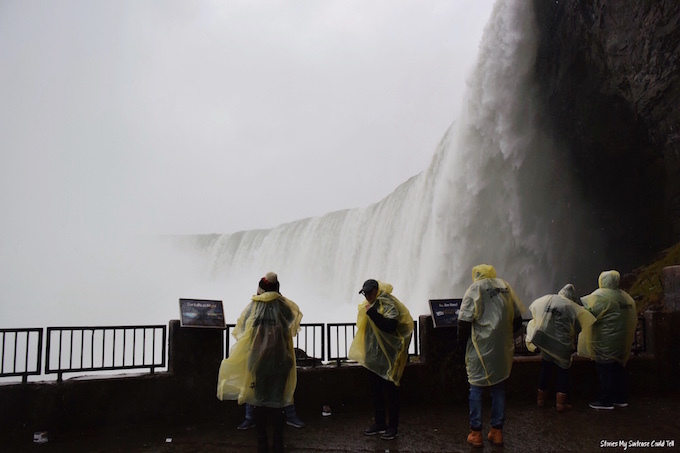 Niagara Falls, as it turns out, is more than the waterfalls – and more than the cross streets of casinos and theme park-style attractions that make up the Clifton Hills tourist area. Niagara Falls is a town in its own right, one we caught glimpses of on our way in and out of the tourist hub: a downtown with grocery stores and shops, like everywhere else; stretches of elegant, expansive homes lining the Niagara River; locals who go about their daily lives and don’t see the Falls from one end of the year to the next. With only one day in town on the itinerary, though, that wasn’t the side of town we would be seeing. We weren’t there for the town at all; we were there for the water. We were there for Niagara Falls themselves. By daylight the next day, the neighbourhood around Clifton Hills was still cheesy, but this time we were ready for it (my Mum even embraced it by buying a bright pink Canada hat, complete with fluffy pom pom and maple leaf, to keep her warm for the day). And unlike the night before – when the Falls were only glimpsed in a wash of colour from the illuminations – the natural wonder was finally fully visible in all its glory. This is what we had come for: the awesome sight of one of the world’s most famous set of waterfalls. 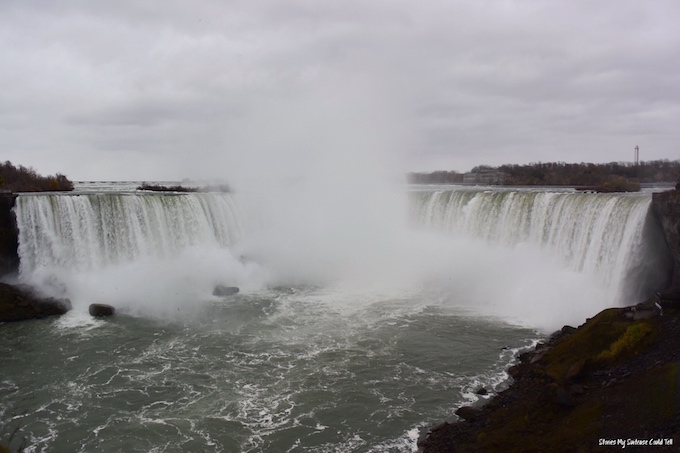 More water flows over Niagara Falls than any other waterfall on earth; every second at high flow, more than 3160 tonnes of water from the Great Lakes flows over the edges of the American Falls, Bridal Falls, and Horseshoe Falls. With snow promised that day, we wasted no time walking along the edge of the gorge – plenty of time for that later – and instead headed straight for the Hornblower Cruise pier, where we donned the trademark Niagara Falls ponchos and filed on board with a small crowd of fellow tourists willing to brave the winter chill. 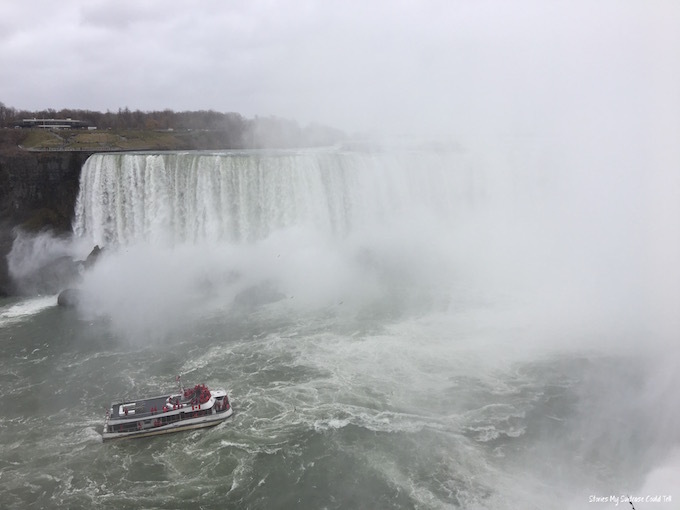 While boat tours have been operating in the Niagara Gorge since 1846, Hornblower Cruises have only been sailing here since 2014, when they took over from the original Maid of the Mist operators (who still sail from the US side of the river). You won’t get the once-iconic blue ponchos anymore – they’ve been changed to red, to make them more Canadian. We all looked faintly ridiculous in our bright red ponchos, but we would soon be more than grateful for them! From land, the American Falls and Bridal Falls don’t seem that impressive, but from the water, when they’re thundering down 181 feet onto deadly-looking rocks below, their power is obvious. The captain paused the boat near them, allowing us to take in the spectacle while regaling us with the facts, figures, and history of the waterfall. 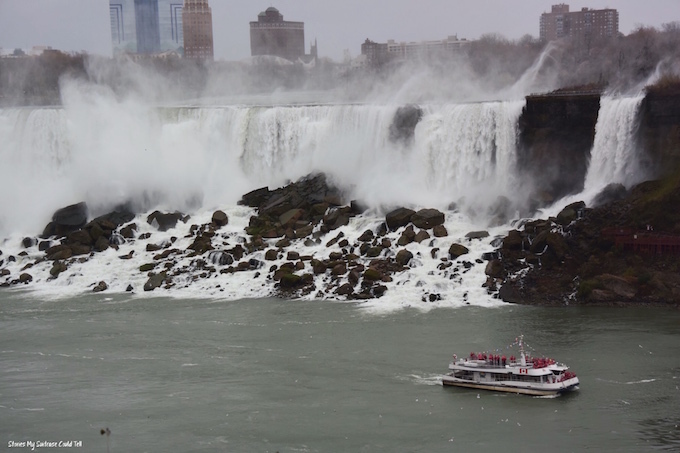 As the boat turned to move downstream towards Horseshoe Falls, on the Canadian side of the border, it was joined by gulls wheeling alongside and swooping low in front of the bow. 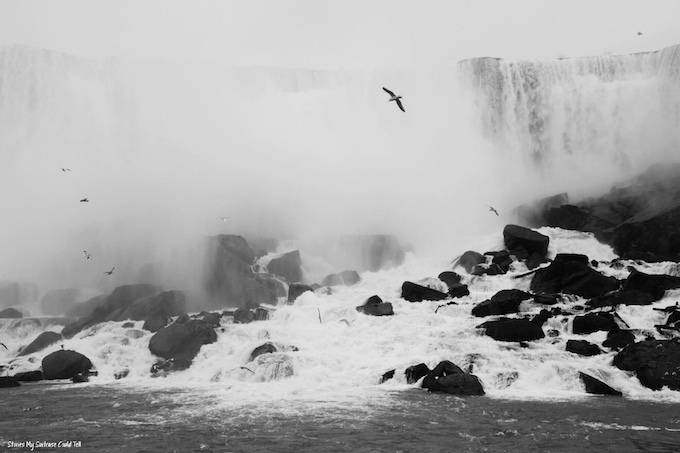 The mist, the immense cloud of moisture generated by the falls’ descent, loomed closer until it almost enveloped us. It happened so fast that it was overwhelming. One minute I was looking up in awe at the water powering over the edge of the rock, and the next all I could see – and feel – was water. And as quickly as it had begun, it was over. 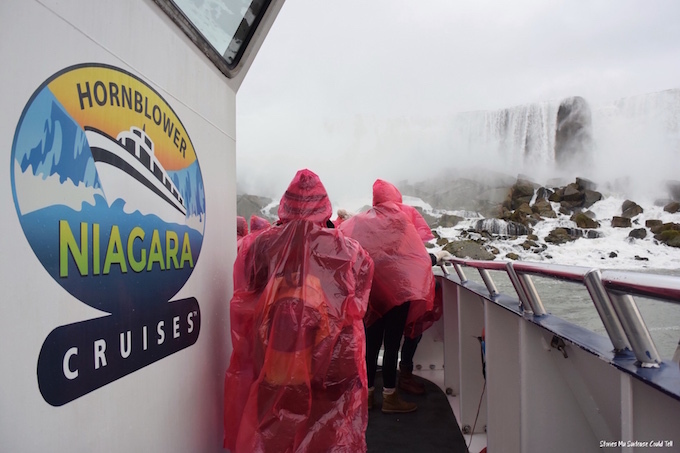 The Hornblower ‘Voyage to the Falls’ Niagara Cruise lasts about half an hour, but to me it felt like 10 minutes. We hadn’t even disembarked before my parents and I were talking about going on the cruise again. It was that incredible, and that overwhelming, we felt we needed to experience it for a second time. Before then, though, we needed to warm up, and Tim Hortons provided the perfect opportunity. Tim Hortons is apparently the Starbucks of Canada, and luckily there was one a quick walk from where the boat docked. Everyone in the tourist centre was ridiculously friendly (it seems what they say about Canadians being nice is true), and my Mum’s bright pink hat was a popular topic of conversation. 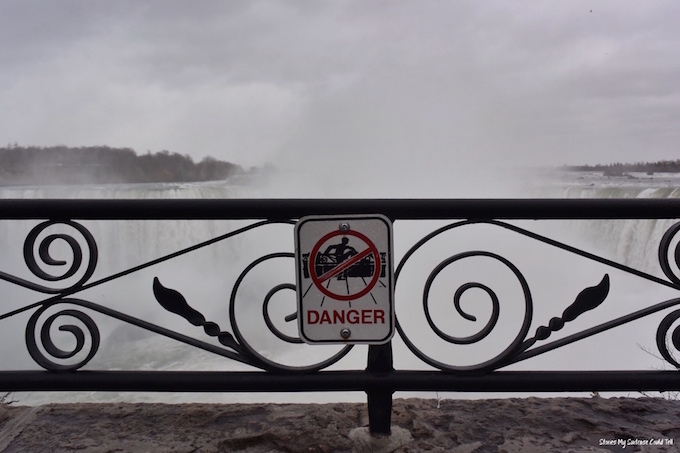 I can admit to feeling slightly nervous as I stood right next to the top of the Falls while they crashed down to the river 170 feet below; I certainly didn’t need the “danger” sign on the worryingly low barrier to tell me that nothing good awaited me on the other side. It was strange to think that over the years people have gone over the edge – some on purpose, and some by accident – and survived to tell the tale. After another Tim Hortons warmed us up (we were regular customers at this point! ), we found ourselves back on the boat, this time positioned at the very front. It was one of the last cruises of the day, and I’m sure the captain edged the boat closer, lingered a little longer at the location where the falling water hit the river. It felt like being in the eye of a storm, with water churning and thundering all around us, splashing in our faces and over our ponchos. It was exhilarating, to feel the brute force of nature so directly. It was freezing, too – I don’t think I warmed up until the next day! – but it was worth it. The whole experience was worth it, despite my initial reservations. Yes, the area around the waterfalls is ridiculously touristy, but if you can separate the commercial from the natural, you won’t be disappointed. 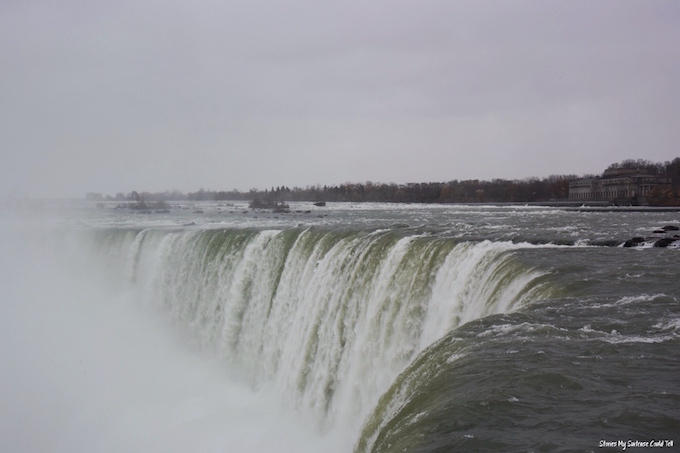 In the end, our visit to Niagara Falls was far from disappointing, as I had first feared it would be. 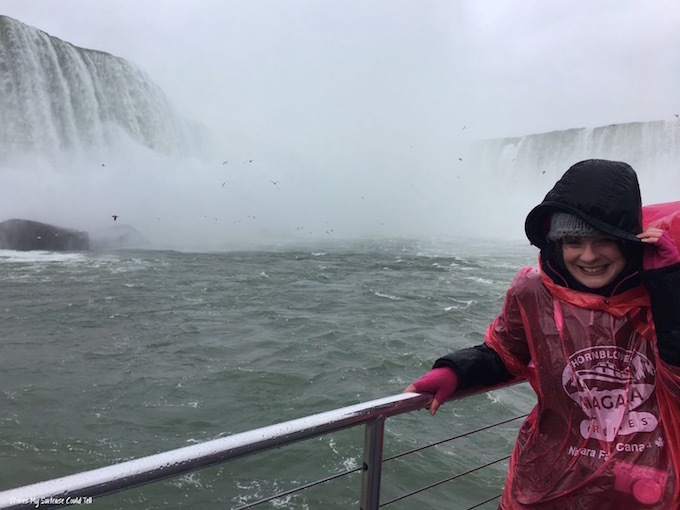 In fact, spending a day at Niagara Falls might just be one of the most thrilling outdoor travel experiences I’ve ever had. It was a timely reminder to keep an open mind while travelling, and never to judge a book (or a place) by its cover. How much does a cruise cost? 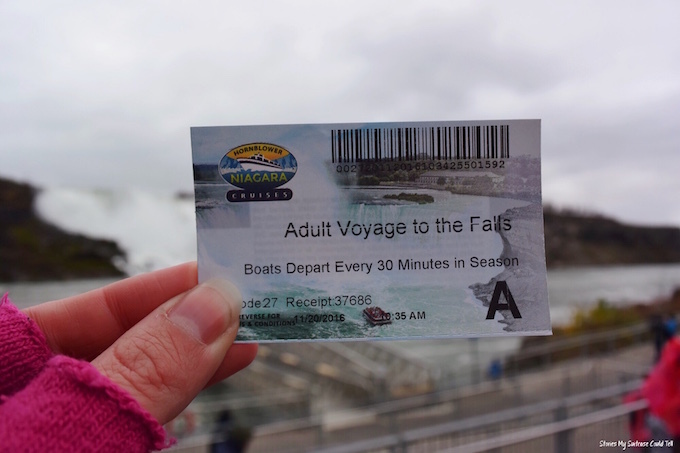 When we visited in November 2016, an adult ticket for the Voyage to the Falls cruise cost $19.95 plus tax, and the Journey Behind the Falls cost $11.50 plus tax. When is the best time to visit Niagara Falls? 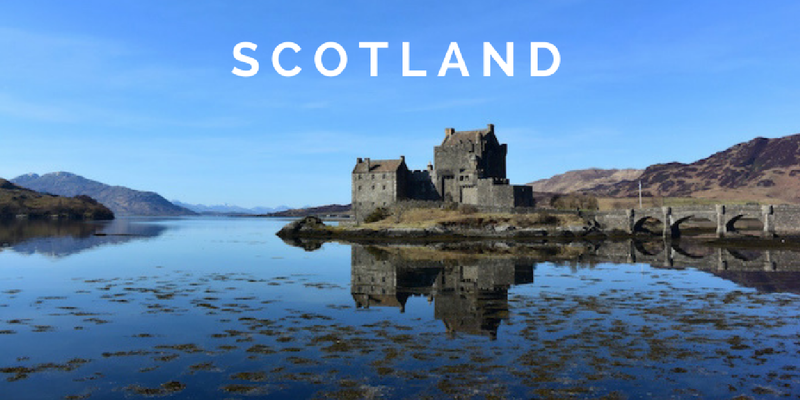 While I can’t vouch for the “best” time to visit (we went in early winter, when there were no crowds), I can tell you that the boat tours usually only operate between April and November. Where should I stay? We stayed in Clifton Hills, the main tourist area next to the Falls, which is where most of the chain hotels are located. But if I was to visit again, I would probably stay a few miles away at Niagara on the Lake (which I hear is very picturesque) and take public transport in to see the Falls themselves. 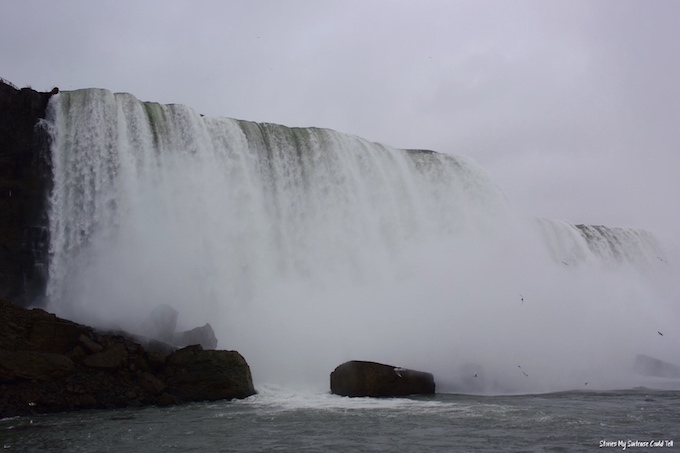 Have you ever visited Niagara Falls, or would you like to? Let me know in the comments – I’d love to hear your opinions on this one! I’ve never been to Niagara Falls, but you’ve inspired me to add it to my bucket list with the beautiful story of your travels! 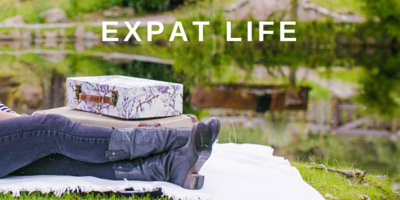 I appreciate your pro tips for peak travel time and accommodation recommendations. 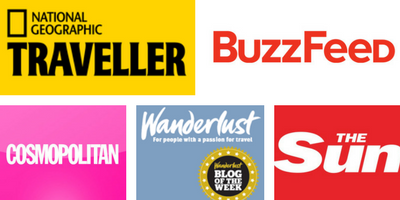 Thanks for your comment, Julie – I’m so pleased the post has inspired you to add it to your travel wish list! We went to Tim Hortons so many times! I’ve heard good things about the wine country too. I think if I ever went back I’d base myself there and just visit the Falls themselves, without staying right by them. So glad you and your family enjoyed the Falls. It would have been nicer in warmer weather i.e. late Spring or early Autumn. Never in summer…..way too crowded. If you ever go back, check out the little town of Niagra on the Lake not far from the Falls. It was named “The Prettiest Little Town in Canada” a few years ago. It is charming and not at all touristy like the Falls. Years ago when we spent our honeymoon there, it wasn’t quite so trashy as it has become over the years. However, seeing the Falls is always amazing. Cheerie Oh for now. I went a couple of years ago and was equally underwhelmed, I never got to go on the boats though but the fact they were lit up felt so man made! I agree about the lights – I’d read the light show was amazing, but I preferred the falls during the day when I could see them properly. 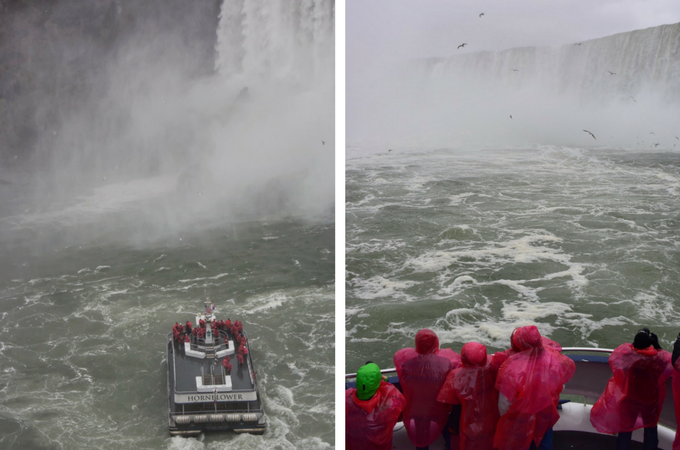 And the boat trips make a huge difference, you forget about everything else around you when you’re up close to the Falls! 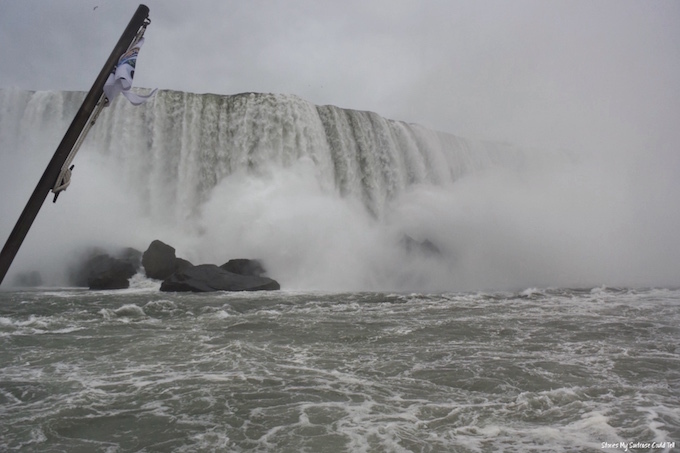 I was also very disappointed by the Niagara Falls. I visited a few years ago and the whole area was, as you said, very built up. I was hoping for something a bit more quaint. Ah lucky you managed to do the boat trip, I don’t think it was running when I went. I also disliked the sky scrapers and tack casinos, but if you drive outside of Niagara then there’s a lovely ice wine vineyard you can visit and do tastings at – so delicious! It was so much fun! I think they were closing for the season soon after we visited. I’ll definitely keep the vineyards in mind if I’m ever back in the area – people keep recommending them to me! I went in college basically just to drink with my high school friends since we could at age 19, haha. I definitely owe Niagara another visit! That’s hilarious! 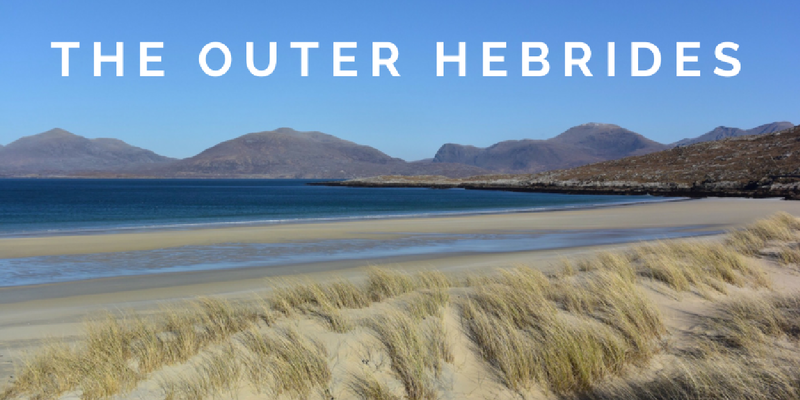 It’s definitely worth seeing properly (although maybe also worth staying outside the super touristy part!). Well done! This post carries its title like a charm! This is more than a mouth full and all that one truly need to know in just one post! 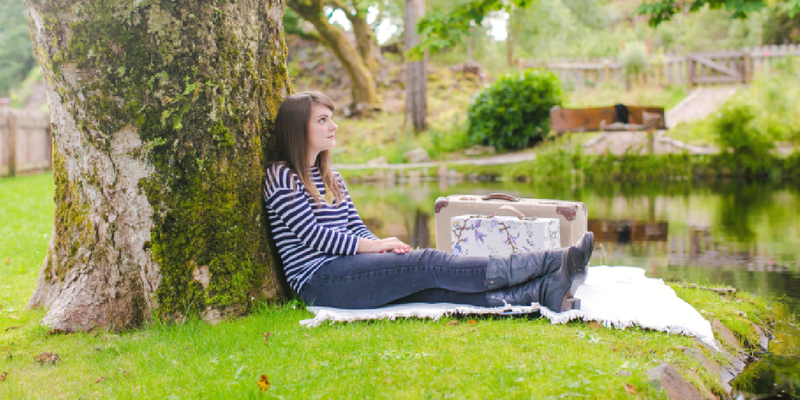 The pictures are STUNNING! I have never been to Niagara Falls, but I hope to go one day. I knew that the falls crossed the borders, but I didn’t realize that there was a difference in the views/experience! 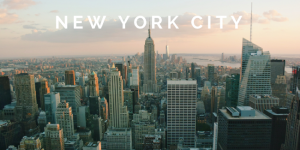 Truly informative guide that I plan to save for when I am able to go on the trip.